Althea assumes now that she, Pax, and Lucas are reunited in spring that the next steps are obvious - locate Deshi and prepare to take down the Others once and for all. But she doesn't expect the subtle changes in Lucas. After being left alone last season with only his Element father for company, Lucas has started to question whether their rightful place isn't with the strange alien race as opposed to humanity. When an emergency forces Lucas to aid the Others so they can remain on Earth, Althea worries that she's lost him once and for all. The one thing she knows is that Deshi's the key to any hope of reclaiming the planet. So as the Others gut their already wobbly support system, Althea and Pax gather together the beginnings of a plan - and maybe an army. Even if she can convince Lucas their side is the right one, the Prime Other holds Deshi captive and shrouds any knowledge about their fourth in clouds of secrecy. What they discover deep underground is a roadblock they didn't expect - and one that could steal their last hope of saving humanity. 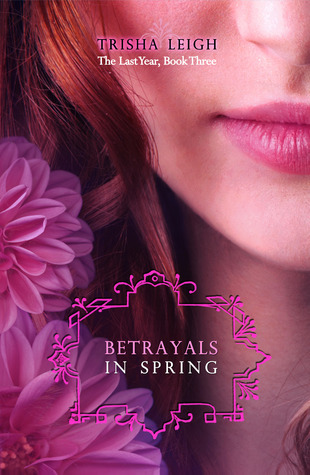 Betrayals in Spring, the third installment in Trisha Leigh's series, The Last Year is, like the two previous books (Whispers in Autumn and Winter Omens), an absolute gem. Once again, her newest novel is even more enticing and successful than the last. In a young adult literature market overpopulated with dystopian and post-apocalyptic writers of all kinds trying to capture the magic of a blockbuster book series like Divergent (Veronica Roth) and The Hunger Games (Suzanne Collins), Trisha Leigh sets herself and her story apart from the rest, raising the bar not just for readers, but for other writers. The Last Year is a more than a simple post-apocalyptic series. Leigh populates her carefully crafted books with elements that can appeal to all readers. She carefully incorporates science fiction elements in the form of The Others, the alien race that arrived on earth in 2015 and changed planets's destiny forever. She takes a fresh approach to the race of the Sidhe, a supernatural race found in Irish and Scottish mythology (often associated with and frequently seen in books that deal with world of faeries or "fey"). She also carefully interweaves elements of American history as her main characters begin to discover what the world was before The Others changed it so drastically. When Betrayals in Spring begins, we find our half-human/half-other Dissidents, Althea, Pax, and Lucas finally united in a cabin provided to them by the Sidhe, Griffin, and his sister, Greer. Magical enchantments on the cabin keep them safe from the Others and allow them the time to regroup, heal, and plan. Pax is recovering from a near-fatal accident that occurred at the end of Winter Omens when he was impaled with a piece of playground equipment. Fighting both the muscle injuries and an infection, he is unconscious and left to be cared for by Althea and Lucas, whose once loving relationship is now suddenly strained. Emotional discomfort and the inability to move forward with any sort of planning to find Deshi (the fourth Dissident) and rescue him from the clutches of The Others cause for an awkward living situation. As Althea tries to bond once more with Lucas and recover some sense of normalcy, she finds herself confused. First, about the emotions she felt for Pax last season, but which were wiped away once she saw Lucas's face again, and second, by the waves of tension rolling off Lucas, who is fighting his own internal battles. As Lucas tries to come to terms with his lineage, both Other and human, to decide whose side he is truly on, Althea tries to recapture their friendship so that they can, at the very least, protect their interests and safety until he decides. But when Lucas's father, Apa (Water), attempts to take his life so that The Others would embrace Lucas as the only being left who could control the water and ice elements on Earth, discontinuing their quest for his death, Lucas agrees to leave and assist The Others. His sacrifice keeps Earth from certain destruction until his father regains his strength, but leaves Pax and Althea worried, praying for his return. The Dissidents receive help multiple times from Griffin and Greer (the latter fighting her own battle with The Others), and eventually are given the clues they need to attempt to infiltrate The Others' Underground Core and retrieve Deshi. Despite their certainty they are walking into a trap, it's a risk they must take. Cadi, their Spritan mentor, has told them that only the four of them together can they rescue the Earth from what will ultimately be destruction if The Others are allowed to continue to extract their vital resource from the earth. Lucas returns, fully committed to saving humanity after discovering that the Broken have now become slaves to The Others in extracting this resource, a radioactive primordial nuclide, which is the key to their survival. But it isn't only those with special powers who assist the Dissidents. Together, they develop a plan to form an army of teens they've met in their previous homes in Atlanta, Portland, Danbury, and Des Moines. They carefully unleash their secret power to unveil these humans and call them to their aide, developing an emergency back-up plan: Should the leaders of these groups of teens not hear from any of the Dissidents in two months, they are to convene at Griffin and Greer's cabin where Brittany, a peer of Althea's from Danbury, is ready to lead the charge. In the meantime, these bold and courageous humans continue research on primordial nuclides, hoping to discover what exactly it is that The Others are after. In an action packed conclusion, filled with obstacles that Althea, Lucas, and Pax could never never have planned for, they find themselves at the mercy of the very last person they would have suspected -- Deshi, who has now embraced his Otherness and trapped his peers, surrounding them with characters ready to kiss away their sanity and beat them to a pulp. It's the very definition of a betrayal, not only in spring, but by spring. The successes of the third installment are numerous. Betrayals in Spring deals with deep human emotions and quandaries: the struggle Althea, Lucas, and Pax face in defining what they mean to each other; Althea's struggle to be as open about her love for Lucas as he is to her in the face of an unknown future; and the question of how far or at what price a race or a civilization of people should go to save themselves and when it goes too far. These are all questions that most people struggle with at some point in their lives and the latter is certainly a question that humanity is facing, even today, on Earth. As a lover of history, Trisha Leigh also manages to weave into the plot some fun and truly interesting historical elements. Leigh doesn't simply write a story, she does her research. Whether it's making sure the history is right or finding a truly unique way to incorporate science and chemistry into the story, she does it accurately and in a way that makes a reader -- like me -- want to pause from my reading and research these things that were unknown to me before, not unlike her characters. She also leaves the readers with a cliffhanger that leaves us ready and excited for more -- but equally sad that the fourth installment will be the last. That Betrayals in Spring was in Amazon's Top 100 for Children's Sci Fi books is no mistake. It's among the absolute best of young adult lit out there with one of the freshest approaches. Five hearts here or five stars on Goodreads.com is simply not enough. This book is absolutely spectacular. It deserves fireworks.